With less than a month to go before Super Hero Generations launches, Bandai Namco games just released a new PV trailer showcasing more of the game’s gorgeous looking battle animation, and what better way to do it than pitting villains against the heroes! 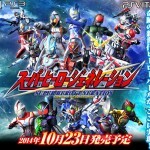 Super Hero Generations will be launching October 23rd for both PS3 and PSVita consoles. 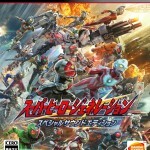 The video features Ultraman Taro, Kamen Rider OOO among others and also confirms Doctor Shinigami made the cut as a rival character to Kamen Rider 1. 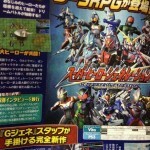 Super Hero Generations is the latest entry in Bandai Namco’s Compati Hero series, a crossover tactical RPG title involving Kamen Rider, Ultraman, and Mobile Suit Gundam coming out for PS3 and PSVita. A new gameplay trailer just recently came out, revealing the game’s theme song: Jumpin’ to Space performed by Psychic Lover, an artist whom in our fandom performed many Super Sentai theme songs including Dekaranger, Boukenger, Shinkenger, and most recently Kyoryuger. Much like in SD Gundam G-Generations, you’ll be able to freely choose which stage you’ll want to play, and it seems that a majority of the characters will be voiced by their returning actor. 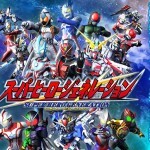 Super Hero Generations is due out October 23rd 2014. Planning on picking up this game? Join the disscussion and let us know in the thread!